Principles and Objectives from the Peninsula study (science fiction at its best) and the Preface from the Portland Peninsula study. The last meeting of the Two-Way Feasibility Study Committee met June 3rd and they found that indeed it IS feasible to make State and High two-way.... Anything is feasible, was the thought. But should it be done is the question! After the March meeting (see below) they really didn't believe that cars were mainly doing 15-25 MPH, so they had their consulting engineer Tom Errico go out and to another speed study - which found that traffic was still doing 23 - 25 or so, sometimes 30 MPH, mainly during the morning rush hour. No speeding : gloom. So, after two hours of discussion and some clarification, after being told that traffic volume was NOT going to change, that pedestrian and biker safety was NOT going to change; that the plan was going to add 7.6% to the city's total cost of clearing snow for JUST High and State, and that the only real effect was to delay traffic thereby increasing air pollution......OH: AND that it was going to cost $3,225,000 at a time when Portland is already $10,000,000 in the hole, a vote was taken : 7 for, 2 against, 2 abstain. Yes, it's feasible, but there wasn't alot of joy in Mudville that night. The Committe had struck out. So, off the plan goes to the Transportation, Sustainability and Energy Committee for further review in the Fall. Project proponents are still liking the two-way plan, maintaining that speeding is causing lots of accidents and threatening pedestrians and bicyclists. Unfortunately for them, their own study, the Portland Police Dept. and MDOT disagree. There was just ONE vehicle accident caused by speeding 2011-2013 ; 26 pedestrian and bicyclist accidents occurred....BUT 22 of those were the fault of the ped or biker. Drivers are not the problem. Neither is "high speed". The failure of the Parkside Neighborhood Association and the Friends of Deering Oaks to get the State Street cut-through eliminated and the park combined into one piece demanded a new effort be made. 1. 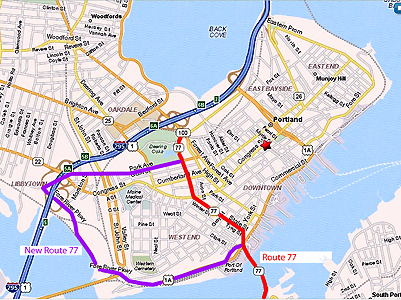 Re-route Route 77, which starts at Forest Avenue there at the park. This would re-direct this state route southwest on Park Avenue to the Fore River Parkway, thence generally East to Commercial Street, where traffic could take the Beach Street on-ramp to the bridge and South Portland. 2. Two-way High and State Streets, returning them to the original flow plan that existed prior to 1972. This would allegedly cause drivers to slow down (they are now doing just 15-30MPH , but that seems to be of little importance) as they all would be dealing with oncoming traffic on a somewhat narrow street. 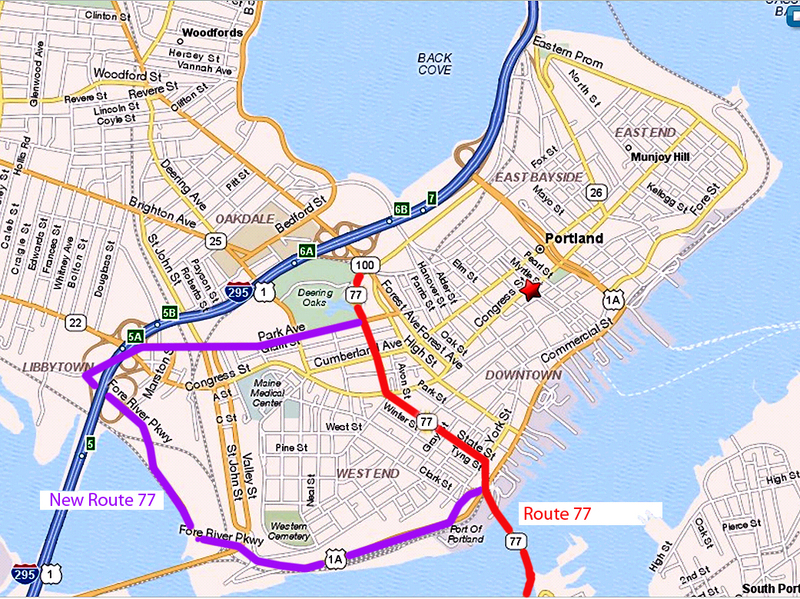 Re-routing 77 would require a waiver from the state, as 77 is a State Route. Those are required to be designated along the shortest, most direct route possible to reduce travel times, congestion, pollution, and the like. The Council, PNA, and FDO don't care about that. The PNA told the state "If there are any state or federal laws that prevent us from doing this project, then those laws have to be changed or ignored"...this in reference to the original Oaks/ State / High St. project. This new one is exactly the same minus the cut-through elimination, which the state nixed. State and High were originally one-wayed in 1972 because there were bad congestion, accident, and winter operation problems. Now there is 60% more traffic, and the proponents want to make things worse. This is desired because if the roads are congested, dangerous, and accident prone, the general public won't want to drive through Parkside, which they don't want you to do. It's their neighborhood Bunky, and you can stay out of it. Go away. Just remember that it's also your taxes that pay for their upkeep. Tough. August 2012 Deering Oaks is the green area behind the arrows. Route 77 starts there. Project proponents want drivers to head off to the left of the picture about 3 miles round trip, to get back to the waterfront versus just driving up and over the Peninsula. See photo below. A. "We want the congestion around the park. If it's congested, people won't want to drive there, and we don't want them driving through our neighborhood" (Parkside Neighborhood Association statement). I don't know about you, but I have a problem with a private organization trying to take over a public utility : the streets. I get to pay for them through my taxes, but I don't get to use them because some people don't want me driving there? How about if they aren't allowed to drive on my street? Think they'd complain? B: The plan is to make the roads "scarier" because people would be facing oncoming traffic going both ways. I think some thought should be given to Winter. Last year there was an 11-car accident at the bottom of High Street where it intersects with Park Avenue. Snow had fallen, and the road was slick. Cars were spinning up State St., slowly. All 11 cars trying to stop for the light just piled up in the intersection, but there were few injuries, as they were all going the same way. Just imagine if they were facing each other on both State and High: Double the fun! Ever been going down High Street on a slippery day? Remember how scary it was? Now imagine traffic coming up the other way! C: Pollution: No thought has been given to the increase in air pollution caused by the congestion. As decreasing air pollution is a stated goal of the State Transportation Implementation Plan (TIP) , the Biennial TIP, the 10-year TIP, Portland's own "Destination Tomorrow", and the Portland Peninsula Study, maybe a second or two of thought about clean air might be good? Knowingly increasing pollution is a violation of a few things like the Clean Air Act, National Environmental Policy Act, EPA rules, DEP rules, MDOT rules, and a host of other alphabet agencies rules. Parkside wants all the traffic getting off I-295, and inbound on Forest and Brighton Avenues to go to Commercial Street. Forest, Brighton, Franklin, and Commercial each handle about 30,000-34,000 vehicles a day, Washington about 25,000. So, what proponents want is to get all the traffic directed to the Fore River Parkway and Commercial Street; about 100,000 vehicles a day: cars, trucks, tourists, you name it. Some of the 100,000 know where they are going, some don't. Portland gets a lot of tourists. If anybody reading this thinks 100,000 vehicles a day, all going to the Old Port on Commercial Street is a good idea, send me your phone number so we can do an interview. And, if increasing congestion to drive people away from a specific area is the idea of this project, as has been stated, then explain to me how this congestion benefits the Old Port, commercial seaport operations, and tourist trade in Portland. March 20th, 2012 at the Maine Historical Society, Councilor David Marshall mentioned a plan to eliminate Franklin arterial and return it to just a local two-way road. From Congress St. to I-295 two lanes of it would be eliminated, filled in, and that space along with the grassy tree-lined median would be flattened and built upon, thereby increasing Portland's tax base. 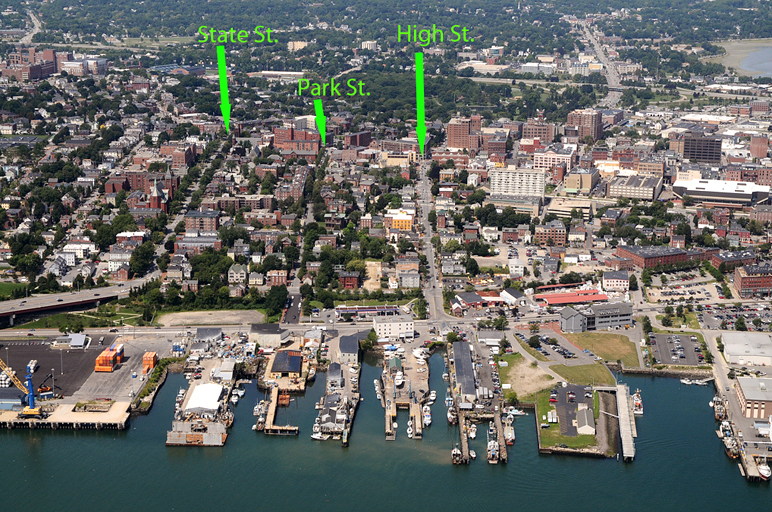 He would also like to see this same kind of thing for Spring Street between the Old Port and High Street. 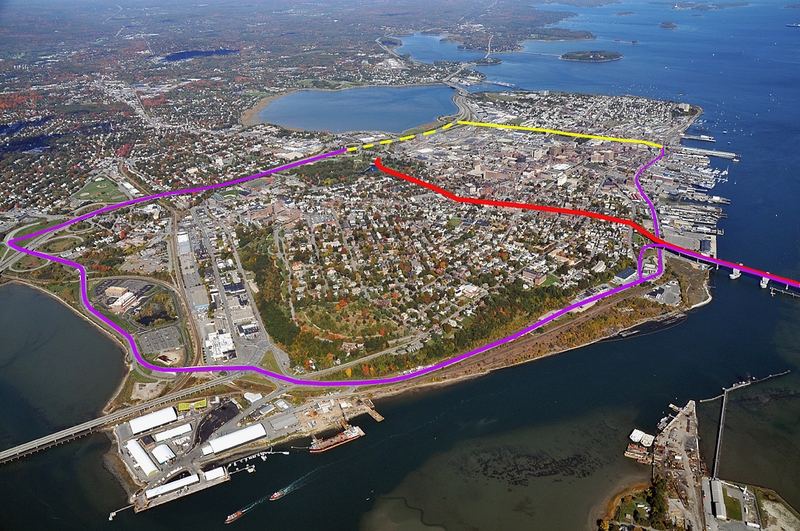 The 4-lane with median would be reduced to 2-lanes, one each way, and the outside lane overlooking the harbor would be built upon. This plan would turn Spring street into a tunnel, with no water views at all. I consider that the Franklin arterial and Spring streets are an asset to the City, allowing the daily working population of the Peninsula that comes and goes to move around and in and out of the city easily. Imagine Portland without the arterials. The State and High proponents sure can. E. And there's more! At the Dec. 19th meeting of the Transportation Committee a member of the Bayside Neighborhood spoke about about taking Elm and Preble Streets out of usage. 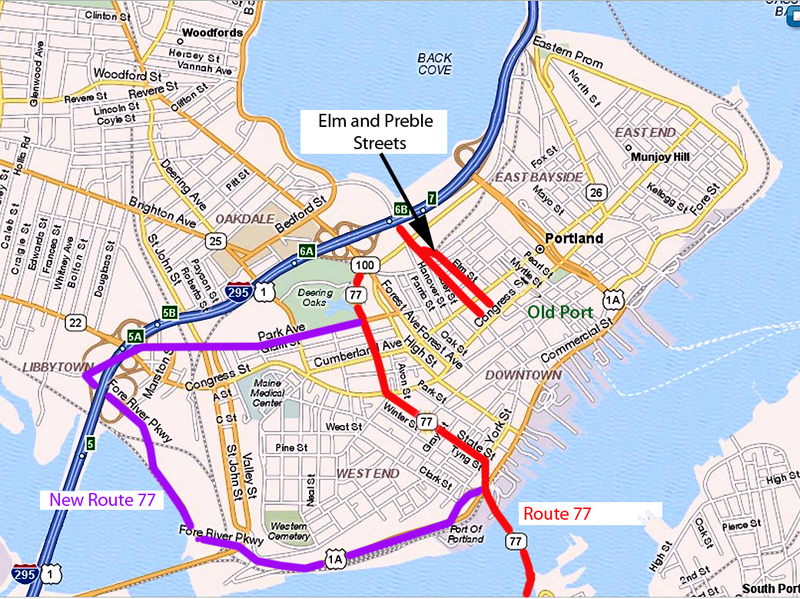 Elm and Preble are the main routes to and from Monument Square in the Downtown and Old Port areas. She didn't like the traffic, repeating the usual mantra: "It hurts our neighborhood!". Councilor Marshall replied: "We can look at that". Such a removal would mean that just Franklin Arterial, High and State, and Commercial St. would be the only access routes to and from the Peninsula.... then take Franklin and High/State out, as is planned, and what do you have left? Sure, it sounds crazy, but what do you think this whole page is about? : It's not sanity and common sense.